LEE TUNG AVENUE is once again welcoming the Chinese New Year with fantastic new installations. This year, the lucky numbers 668 (which is a homophone of “all the way to wealth” in Chinese) and 238 (which shares the same pronunciation as “wealth comes generously” in Chinese) have been applied to ingenious effect. Featuring 668 large red and gold lanterns, which depict the wish for a bright and satisfying future, and 238 gold coins, LEE TUNG AVENUE offers visitors the ultimate festive indulgence. The image of coins has been common in Chinese culture since time immemorial. As “wealth” is homophonic to “before” in Chinese, and the round hollow shape of a coin looks like an eye, they together signify “wealth is before your eyes”. 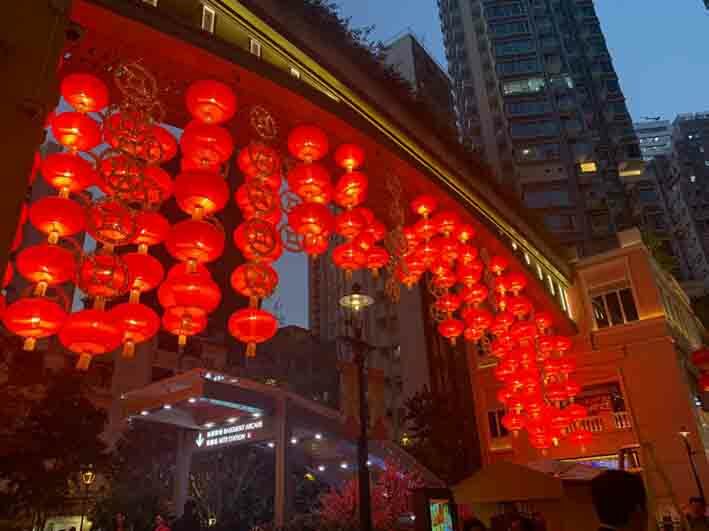 To welcome a remarkable new season of celebration, LEE TUNG AVENUE in Wan Chai, a joint project between Urban Renewal Authority, Sino Land Company Limited, is embracing the Year of the Pig with Hong Kong’s largest outdoor New Year walkway from 29th January to 28th February 2019. Entitled “Prosperous and Auspicious Year of The Pig”, this festive walkway features 668 large red and gold lanterns, which symbolise the wish for a bright and joyful future. The tree-lined walkway is also adorned with 238 gold coins, representing fortune and prosperity. In the Central Piazza of LEE TUNG AVENUE, a large piggy “Prosperous and Auspicious Year of The Pig” offers auspicious greetings and blessings for a wealthy and fruitful year ahead. In addition, LEE TUNG AVENUE is proud to be cooperating with the Hong Kong Deposit Protection Board in its “Save with Confidence‧An Auspicious Year of the Pig” Public Art Exhibition campaign by displaying 66 artistic piggies. Come and experience the inspirational pleasures and auspicious delights of LEE TUNG AVENUE this Chinese New Year, where Hong Kong’s coolest check-in points await you! LEE TUNG AVENUE is once again welcoming the Chinese New Year with fantastic new installations. This year, the lucky numbers 668 (which is a homophone of “all the way to wealth” in Chinese) and 238 (which shares the same pronunciation as “wealth comes generously” in Chinese) have been applied to ingenious effect. Featuring 668 large red and gold lanterns, which depict the wish for a bright and satisfying future, and 238 gold coins, LEE TUNG AVENUE offers visitors the ultimate festive indulgence. The image of coins has been common in Chinese culture since time immemorial. As “wealth” is homophonic to “before” in Chinese, and the round hollow shape of a coin looks like an eye, they together signify “wealth is before your eyes”. 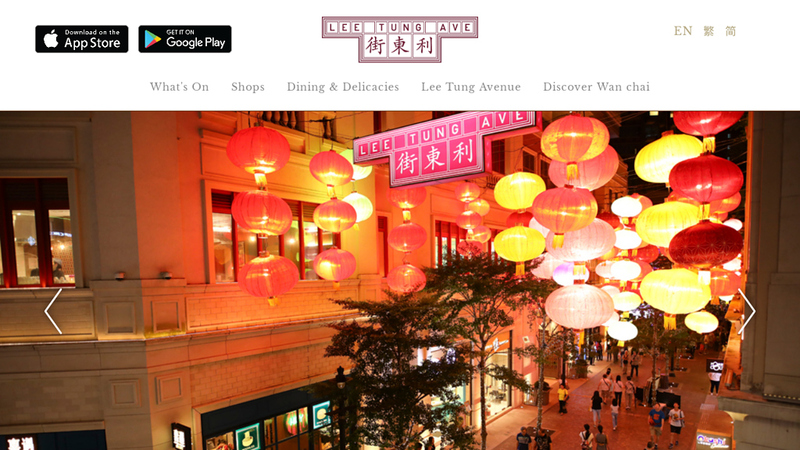 By walking along the Avenue beneath fabulous lanterns filled with blessings, visitors can enjoy a dazzling spectacle and share auspicious festive moments with friends and loved ones. In Chinese tradition, it’s also common for parents to prepare a lantern, which is a symbol of a prosperous future, for their children in the first month of the academic year. Teachers light this lantern in the hope of the students achieving a bright future. Moreover, “lighting up lanterns” and “having a new-born baby” are homonyms in Chinese, making LEE TUNG AVENUE the perfect place for families and prospective parents to come and make a wish for both wealth and children! 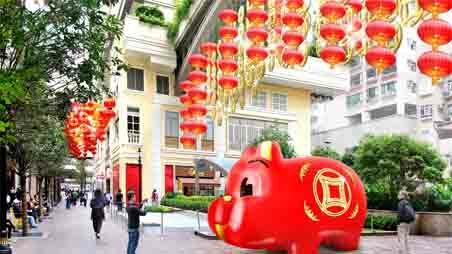 LEE TUNG AVENUE proudly presents a giant piggy named “Prosperous and Auspicious Year of The Pig” in the Central Piazza. According to Chinese custom, the pig is regarded as a symbol of children; hence brides receive golden pig jewellery, which is associated with fertility and virility. Moreover, pigs are believed to be highly clever. Couples who aspire to have babies in this blessed year can come to the Avenue and take pictures with “Prosperous and Auspicious Year of The Pig”. The coins on the giant piggy likewise symbolise wealth accumulation, making it an ideal place for parents to bring their children to wish for great wealth and intelligence! 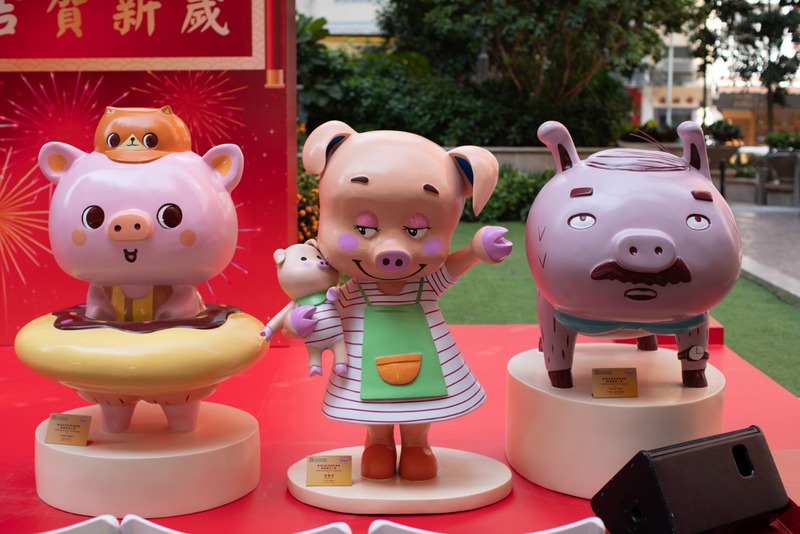 LEE TUNG AVENUE also displays a collection of artistic piggies entitled “Save with Confidence‧An Auspicious Year of the Pig” Public Art Exhibition from the Hong Kong Deposit Protection Board (the Board) from 24th January to 28th February 2019. Three of these spectacular piglets are designed by local illustrator, Lee Wai-chun, John Chan and Nicky Sun. Other eye-catching piglets have been designed by a wide variety of demographics and social groups. The roving exhibitions can raise public awareness and understanding of the deposit protection scheme. Visitors can come and enjoy this heart-warming new exhibition, while also receiving souvenirs and joining the activities including Red Packet Piggy Bank DIY Workshops, Piggy Bank Painting Workshops, drama and seminar organised by the Board. 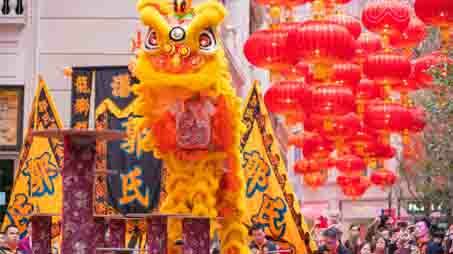 LEE TUNG AVENUE and The East are truly the perfect family destination this Chinese New Year! The press release is distributed by E’s Concept Communication Limited on behalf of LEE TUNG AVENUE Management Company Ltd. For any inquiries, please contact Sharon Ma at sharon@esconcept.com or 852-3468-6311.